Nitin Agarwal, Xiangmin Xu and M Gopi, Journal of Neuroscience 2018. Yuqi Li, Aditi Majumder, M. Gopi, Chong Wang and Jieyu Zhao, EUROGRAPHICS 2018. Nitin Agarwal, Xiangmin Xu, M. Gopi, MICCAI Workshop of Medical Computer Vision (MCV) 2016. ACM Transactions on Graphics (SIGGRAPH) Paper presented in July 2016. ICCP paper presented in May 2016, Chicago U.S.
Mahdi Abbaspour Tehrani, Aditi Majumder, M. Gopi, IEEE International Conference on Computational Photography (ICCP) 2016. 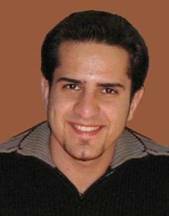 Mahdi Tehrani recieved Link Foundation Fellowship in Modeling, Simulation, and Training for the 2016-17 academic year. Authors: Behzad Sajadi, Mahdi Abbaspour Tehrani, Mehdi Rahimzadeh, Aditi Majumder. Uddipan's paper titled "Finding Feature Similarites Between Geometric Trees" have been accepted to Pacific Graphics 2014. The paper by Shanaz Mistry, Niranjan U N and M. Gopi on fitting 2D polygons using a data structure representing the cavities and the protrusions of a polygon is to be presented at the SIAM Conference on Geometric and Physical Modeling (GD/SPM13). It is our great pride to report that the planar multi-projection display, which is currently the attention of a significant amount of research conducted in the iGravi lab, is part of the logo for the top international conference in virtual reality, IEEE Virtual Reality 2013. IEEE VR 2012 was hosted by the iGravi lab in March 2012. It was the most attended conference in the history of IEEE VR. As part of IEEE VR 2012, we had a very successful Open House at Calit2 showcasing all the research projects at iGravi where we also demonstrated this planar multi-projector display. Almost 450 people from around the globe attended the Open House. We had two papers in Siggraph 2012 from UCI. This is the first time we have had papers in Siggraph from UCI. Our paper on new enhanced resolution projection based displays was one of the four papers in the sole session on Computational Displays -- a very new emerging area in computer graphics and visualilzation community. The other papers were from MIT, Stanford and UC-Berkeley. We are very proud to wrestle a spot amongst such well-know players. The second paper was a joint work with Purdue University and was in the Appearance section. The other papers were from Yale University, MIT, Microsoft Research and HP Labs. Computer Science Professor Aditi Majumder and graduate student Behzad Sajadi's paper is accepted to ACM Siggraph 2012. The paper, "Edge-Guided Resolution Enhancement in Projectors via Optical Pixel Sharing," proposes a technique for achieving higher resolution displays using lower resolution projectors. ACM Siggraph 2012 is the top international venue for computer graphics researchers and practitioners. Computer Science Professor Aditi Majumder and graduate student Behzad Sajadi paper is accepted to TOG 2012 and will be presented at ACM Siggraph 2012. The paper, entitled "Fast High-Resolution Appearance Editing Using Superimposed Projections," proposes a technique that superimposes multiple projections onto an object of arbitrary shape and color to produce high resolution appearance changes. The full paper can be accessed here: http://www.ics.uci.edu/~bsajadi/files/tog12.pdf. Computer Science Professor Aditi Majumder and graduate student Behzad Sajadi will be presenting at the IEEE Visualization 2012 Conference. The paper, entitled "Using Patterns to Encode Color Information in Dichromats," explores ways to use patterns to represent color. This paper proposes a technique for using patterns to encode color information for individuals with CVD, in particular for dichromats. Further, since overlaying patterns does not compromise the underlying original colors, it does not hamper the perception of normal trichromats. The full paper can be accessed here: http://www.ics.uci.edu/~bsajadi/files/CVD-ColorEnconding.pdf. Prof. Majumder's research was highlighted in the second week of October via a campus level feature on the UCI website (http://www.uci.edu). The feature titled "Developing the Display Technologies of the Future" focused on Prof. Majumder's work on ubiquitous displays which has the potential to be used just about everywhere, from huge domes to small cell phones, from amusement parks to doctors’ exam rooms. This research is funded by a $0.65M 5-year NSF CAREER grant. Prof. Majumder was awarded the nVidia academic partnership grant. As part of this grant she received high-end GPUs from nVidia worth around $20,000. There are around 70 nVidia academic partners around the world of whom around 45 are from the United States including Marc Levoy from Stanford University, Markus Gross from ETH Zurich, Gabriel Taubin from Brown University, Ravi Ramamoorthi from UC-Berkeley and David Ebert from Purdue University. Prof. Majumder and Prof. Gopi's efforts were instrumental in winning an nVidia grant awarding UCI the status of CUDA Teaching Center (CTC). The grant consisted of equipment grant of 46 GTX580 GPUs and C2070 Tesla board which will be used to improve and augment ICS instructional facility and 50% instructional support funding for two quarters to help students in the lab with CUDA programming training. There are several such CTCs around the world including Purdue University, Rochester Institute of Technology, George Mason University, University of Wisconsin Madison, University of Texas Austin, UC-Los Angeles, and UNC Charlotte. Aditi Majumder, Computer Science Associate Professor, was a keynote speaker at the International Symposium on Visual Computing 2010, a prestigious graphics and vision conference that brings together renowned researchers from all over the world. Majumder’s talk, “Ubiquitous Displays: A Distributed Network of Active Displays,” presents her team’s work-in-progress on developing a new display paradigm in which displays are not mere carriers of information, but active members of the workspace — interacting with data, user, environment and other displays. The goal is to integrate such active displays seamlessly with the environment, making them ubiquitous to multiple users and data. Majumder’s research aims to make multi-projector displays truly commodity products and easily accessible to the common man. Her significant research contributions include photometric and color registration across multi-projector displays, enabling use of imperfect projectors in tiled displays, and more recently a distributed framework for tiled displays via a distributed network of projector-camera pairs. A 2009 recipient of the NSF CAREER award, she has played a key role in developing the first curved screen multi-projector display being marketed by NEC/Alienware and is an advisor at Disney Imagineering for advances in their projection-based theme park rides. 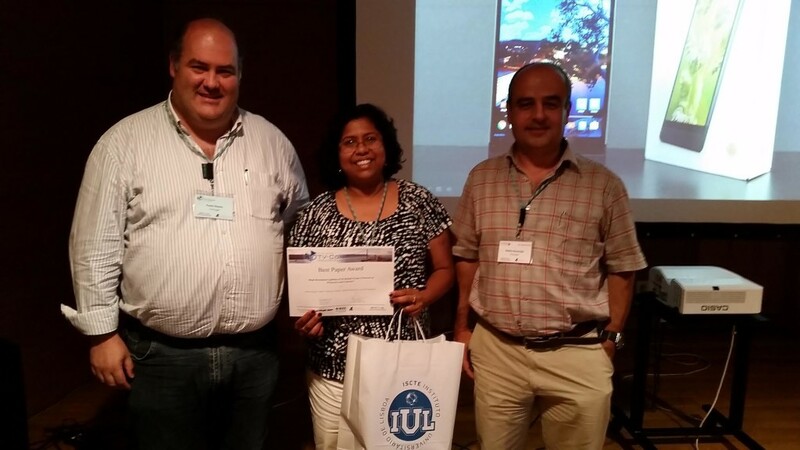 Computer science professor Aditi Majumder has been awarded a Best Paper Award at the IEEE Workshop on Projector and Camera Systems (PROCAMS) held at the IEEE Conference on Computer Vision and Pattern Recognition (CVPR) in San Francisco. Her paper entitled, "Display Gamut Reshaping for Color Emulation and Balancing" was coauthored by researchers at Ostendo Technologies Ltd.
Majumder et al present a hardware-assisted 3D gamut reshaping method that handles a gamut expansion in LED based DLP displays in emerging mobile digital light projectors (known commonly as pico-projectors). These projectors use multiple LED/laser sources instead of a singular white lamp providing a larger color gamut. The full abstract and paper can be found here [PDF link]. The IEEE CVPR Workshop on PROCAMS is one of the top international venues for projector-camera systems researchers and practitioners. Majumder's research addresses novel projection based displays and methodologies to register and interact with them - an important problem to both the scientific and entertainment fields. Majumder has developed a suite of mathematical models, methods and software to register and interact with large tiled projection based displays. Computer Science Professor Aditi Majumder and graduate student Behzad Sajadi have received the Best Paper Award at the IEEE Virtual Reality 2010 conference held in Boston. The paper, entitled "Auto-Calibration of Cylindrical Multi-Projector Systems," explores registering multiple projectors on vertically extruded a cylindrical display, which previously was only possible with a calibrated stereo camera. This papers shows that using some simple priors, one can achieve multiple projector registration on a cylindrical display using a single uncalibrated camera without any markers on the display. More importantly, the new method enables use of multiple overlapped projectors across corners of a vertically extruded surface with sharp edges. This is of tremendous benefit to virtual reality display systems like CAVEs, that avoided mounting projectors across the corners until today. The full paper can be accessed here: http://www.ics.uci.edu/~majumder/docs/VR10.pdf. IEEE Virtual Reality 2010 is the top international venue for virtual reality researchers and practitioners. Professor Majumder's research addresses how to produce a seamless image on a large-scale tiled display - an important problem to both the scientific and entertainment fields. Majumder has developed a suite of mathematical models, methods and software to correct the geometric, chromatic and luminescent variations that arise when tiling multiple projection displays. A paper entitled, "Markerless View-Independent Registration of Multiple Distorted Projectors on Extruded Surfaces Using an Uncalibrated Camera" by Computer Science professor Aditi Majumder and graduate student Behzad Sajadi has won the runner up in the Best Paper Award at the IEEE Visualization 2009 conference held in Atlantic City this month. The paper presents the first algorithm to geometrically register multiple projectors in a view-independent manner on a common type of curved surface, vertically extruded surface, using an uncalibrated camera without attaching any obtrusive markers to the display screen. This simple markerless registration has the potential to have a large impact on easy set-up and maintenance of large curved multi-projector displays, common for visualization, edutainment, training and simulation applications. IEEE Visualization is the premier annual forum for visualization advances for academia, government, and industry. This event brings together researchers and practitioners with a shared interest in visualization tools, techniques, and technology. Majumder's research addresses how to produce a seamless image on a large-scale tiled display - an important problem to both the scientific and entertainment fields. She has developed a suite of mathematical models, methods and software to correct the geometric and color variations that arise when tiling multiple projection displays.